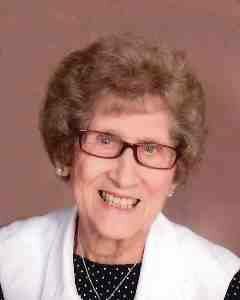 LaDonna Grochow, age 88, of Gaylord passed away Friday, March 15, 2019, at Oak Terrace Health Care Center in Gaylord. Funeral Service will be Tuesday, March 19, 2019, 11:00 A.M. at Immanuel Lutheran Church in Gaylord with interment in the church cemetery. Visitation will be Monday, March 18, 2019, from 3:00 P.M.-7:00 P.M. at Immanuel Lutheran Church in Gaylord. Visitation will continue one hour prior to the service at the church on Tuesday. LaDonna Adelia Grochow was born on March 31, 1930, in Penn Township, McLeod County, Minnesota. She was the daughter of Rueben and Elsie (Tietz) Wendlandt. LaDonna was baptized as an infant and was later confirmed in her faith as a youth, both at St. Mathew’s Lutheran Church in Penn Township. She received her education at District #16 Country School in Penn Township and was a graduate of the Brownton High School. On May 3, 1949, LaDonna was united in marriage to Wayne Grochow at St. Matthew’s Lutheran Church, Penn Township, McLeod County, Minnesota. After their marriage the couple farmed in Transit Township, Sibley County, Minnesota. She was a loving mother and homemaker. She liked to stay busy and helped her children out in their different professions. LaDonna and Wayne were blessed with three children. The couple shared 56 years of marriage before Wayne passed away on March 28, 2006. LaDonna was a member of Immanuel Lutheran Church in Gaylord. LaDonna passed away on Friday, March 15, 2019, at Oak Terrace Health Care Center in Gaylord at the age of 88 years. Blessed be her memory. LaDonna was preceded in death by her Parents, Rueben and Elsie Wendlandt; Husband, Wayne Grochow; Grandson, Wade Busse; Sister, Cevella Lindeman; Brother, Delford (Elva) Wendlandt; Brothers-In-Law, Melvin Dose, Melvin Grochow, and Nelford (Mildred) Krueger. Kenny and I express our deepest sympathy to the family of this sweet lady, LaDonna!! Enjoyed here visits after or before church services. Blessed be her memory! Our thoughts and prayers are with you!! LaDonna was a sweet lady who always said hi to me. Prayers of comfort to friends and family. Your sweet mother had a beautiful smile and always a kind word. She has always been someone I’ve admired for her wisdom, confidence and compassion. You are left with wonderful and beautiful memories of an amazing woman. Oh that we had more like her in this world. So very sorry for your loss. Sending our love and sympathy. Our thoughts and prayers to the Grochow family. LaDonna always had a smile and was always very friendly. My prayers & sympathy to your families. Hugs to all.